WELCOME TO CROWDFUNDING! SCROLL DOWN TO SEE THE FUN STUFF LIKE T-SHIRTS AND MAGNUMS...OR READ MORE BELOW. The dream has begun at Attwoods with the planting of our vineyard, and we’re hoping with your help, it can continue. Our goal is to transform our hay shed into a small winery, in order that we can both grow our fruit and make our wine, on site, at our property at Attwoods Road, Scotburn. Having a winery and tasting room here in Scotsburn, will take our operation to the next level. Not only does this mean we can be totally self sufficient, but also that we are creating a place where you can come and share the experience with us. Humble plans, for a small development which has room to grow, as we do. The ultimate dream! Excavate into the natural slope of the hill, creating an underground, temperature controlled barrel hall, enabling us to gravity feed our barrels from tank. $100,000 + gets us to Stage 3 and beyond! Pledge or buy one of our unique experiences or products below priced from $50 - $1000. You could name your own row, spend a day winemaking or buy some wine at a ridiculously reasonable price...there is something for everyone! You're a legend! 100% of your donation will go towards the winery build. We deeply appreciate your donation! Naming rights to a row at our Attwoods close planted, Pinot Noir vineyard. (84 rows ONLY.) Your name, inscribed on the post, forever. Something truly special, that will be passed down in your family for generations. A magnum of the first ever vintage from this vineyard with a personalised label - your name and row number. ‘Live like a Winemaker Day’: come and join us during harvest to get your hands (and feet) dirty! Attwoods Vintage 2018 T-Shirt: vintage tee designed by local artist (and legend) Travis Price. We are now selling futures in the first ever vintage from our vineyard at Attwoods. Our first harvest will be in 2019 - from this very special, close-planted, Pinot Noir vineyard, called Attwoods 'Mon Climat' Pinot Noir. ('My Block'). Quantity extremely limited, will sell out. NB: $10 delivery (flat rate) within Australia. Overseas shipping POA. 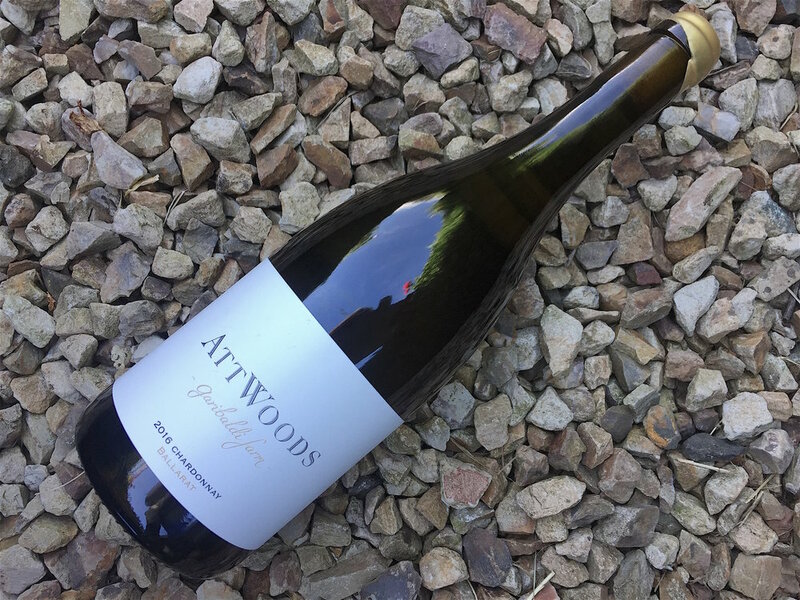 Pre-purchase a magnum of the first ever vintage from this very special, close-planted, Pinot Noir vineyard, called Attwoods 'Mon Climat' Pinot Noir. ('My Block'). Quantity extremely limited, will sell out. Shipping $10 within Australia. Overseas shipping POA. 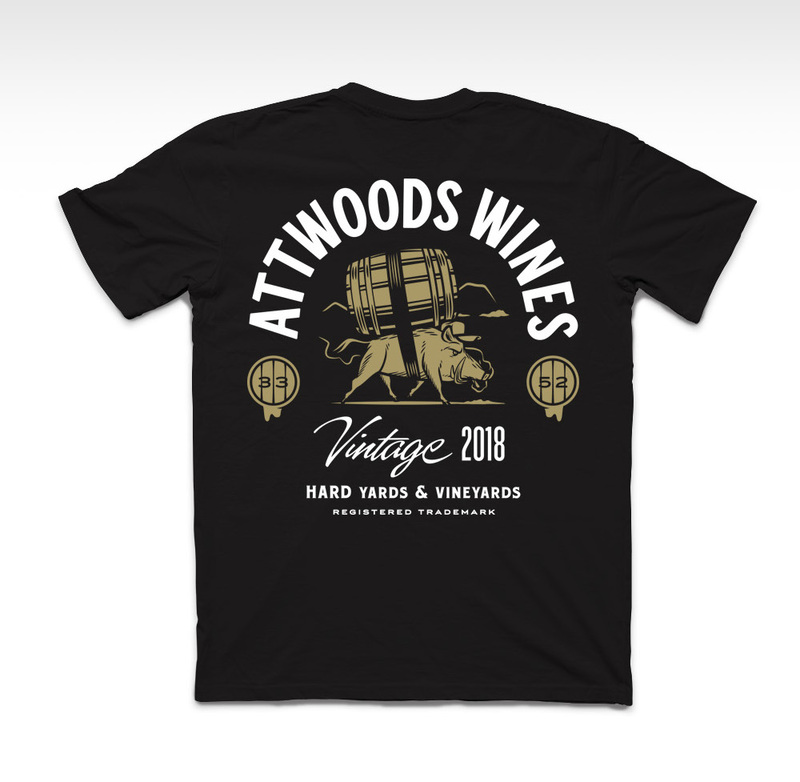 Buy an Attwoods Vintage 2018 T-Shirt and wear it with pride. This awesome Tee is designed by local artist (and legend) Travis Price. Quality screen print gold and white onto black Premium AS Colour tees, front pocket logo, full artwork on the back.